The Bank of England has raised interest rates to 0.75% – the highest level since the financial crisis – after a unanimous decision by its rate-setting committee. In a hugely symbolic day for the Bank of England, the Monetary Policy Committee voted to increate the rate from 0.5% in only the second rate rise in a decade. The MPC said that any future increases “are likely to be at a gradual pace and to a limited extent” and said that the outlook for the economy could be “influenced significantly” by Brexit. 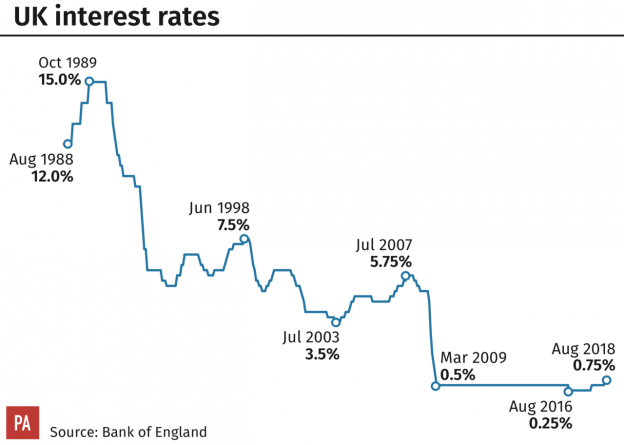 Interest rates were cut to 0.5% in March 2009 when the markets were in the grip of the banking crisis and remained at that level until August 2016 when they were cut to 0.25% in the aftermath of the EU referendum. In November last year, rates were increased back up to 0.5% and today’s rise will push up mortgage payments by an estimated £400 a year and may offer some relief to savers on rock-bottom rates. This is the first time the borrowing rate has been set at 0.75% – when the rate was cut in March 2009 it was by half a percentage point. Laith Khalaf, senior analyst at Hargreaves Lansdown, said it was a “hugely symbolic day” as although the markets had been expecting the Bank of England to move it meant that rates were higher than 0.5% for the first time since the financial crisis. While the markets had been expecting the MPC to vote to raise rates, it had not been expecting the decision to be unanimous among the nine members of the committee, chaired by Bank of England governor Mark Carney. Research by credit checking agency Experian found that the rate rise would push up mortgage bills by £400m a year for those on standard variable rates and trackers. The calculation is based on a standard variable rate of 3.99% on a £250,000 20 year mortgage and a tracker rate 2% above the Bank rate. Savers were being encouraged to shop around for higher rates. “Many put up with paltry 0.1% returns – or worse,” said Guy Anker, deputy editor of MoneySavingExpert.com. This entry was posted in Uncategorized on August 2, 2018 by Stuart Stirling.